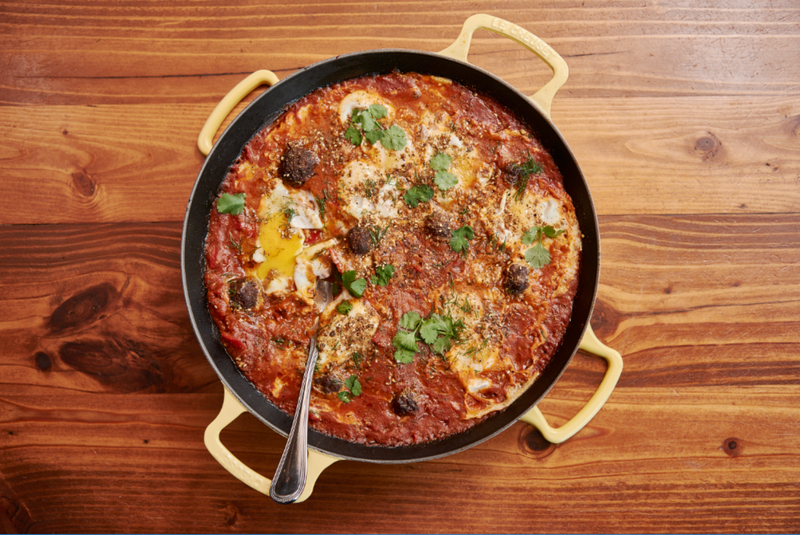 The Pacific Northwest is falling in love with shakshuka and hummus. 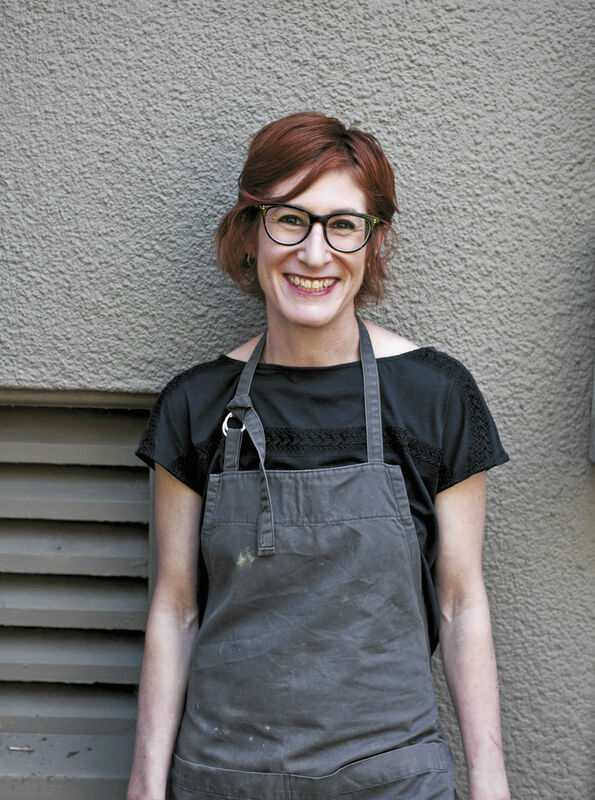 Portland, Oregon has been gaining notoriety as a food destination for many years, and we are proud to see that Israeli food is now making its mark in the city with Chef Jenn Louis’ restaurant Ray. In case you haven’t heard of her yet, Chef Jenn Louis has appeared on Bravo’s Top Chef, has received two James Beard nominations, and was featured in Food & Wine’s 2012 “Best New Chefs” list. She has also written two cookbooks. Bottom line: she’s crazy talented. And now her love of vegetables and Israeli cuisine has inspired her latest restaurant venture, bringing Israeli cuisine to the good people of Portland. I had the chance to chat with Jenn this month about Ray, and was inspired by her love of learning, prideful Jewish roots and deep respect for the diversity of Israeli cuisine. You first headed to Israel in college. What was the inspiration for going? My major was environmental studies and there was a trip over spring break all about the environment, and so it was perfect. My parents hadn’t wanted me to study abroad, but they did let me go on this trip to Israel. I remember getting off the plane — it was my first really big trip overseas — I was so tired and hungry, and it was so hot. They put us on the little bus and handed out dried fruit and nuts. This stuck with me, because it always set the tone for what Israeli is: natural, delicious, eating food that makes your feel good. The ingredients in Israel are so real. If you’re eating a berry, it’s an intensely delicious berry. I went back to Israel again after college and lived on Kibbutz Yotvata in the Arava, which is famous for their dairy. It was an intense experience.But I just think it’s so cool that from the time when my parents didn’t even want me to travel to Israel, until now, Jewish food has gained such popularity. We have come a long way. We aren’t a culture that is persecuted, but celebrated. So how did you decide to open an Israeli restaurant? I went back again to Israel around two years ago with other chefs on a trip sponsored by the Ministry of Tourism. We ate from morning till night, and I tasted all these things I had never experienced before. It was a delicious, fun and inspiring trip. I returned and started cooking specials on the menu of my restaurant Lincoln that I had eaten on the trips, and the response was really positive. The shakshuka and hawaijj spice — they were deep flavors people hadn’t ever had tasted. And I had been doing the same thing for so many years, I was really ready to do something new, which would also be new to the Portland community. I think in general Americans eat less formally than we used to, and Israeli food lends itself well to that less formal style. And I am not afraid to say that this is Israeli cooking, not Mediterranean. Israel’s cuisine is inspired by so many different people. Last time I was in Israel, I went to a Georgian restaurant, so now we are serving Georgian wine on our menu. And I spent time at an Egyptian Jewish restaurant in Israel. Palestinian food is also crazy delicious. How did you plan the menu for Ray? I should explain that I named the restaurant “Ray,” meaning ray of hope for the world’s needs, America’s needs and Israel’s needs. I think a lot about tikkun olam and making the world a better place, and Ray is a part of that. As I planned the menu, I was thinking about which dishes I really wanted to share with people: What do I want to be traditional and what kind of recipes do I want to be more playful with. Everyone serves hummus, but I wanted to play with it, so we are doing a beet hummus and carrot hummus that I just love. But then some dishes are so soulful and rich, like the Yemenite braised chicken, I wanted to keep it traditional. Other dishes I said, let’s put a slab of foie gras on top of that. Lets create a tartar with a different flavor profile. 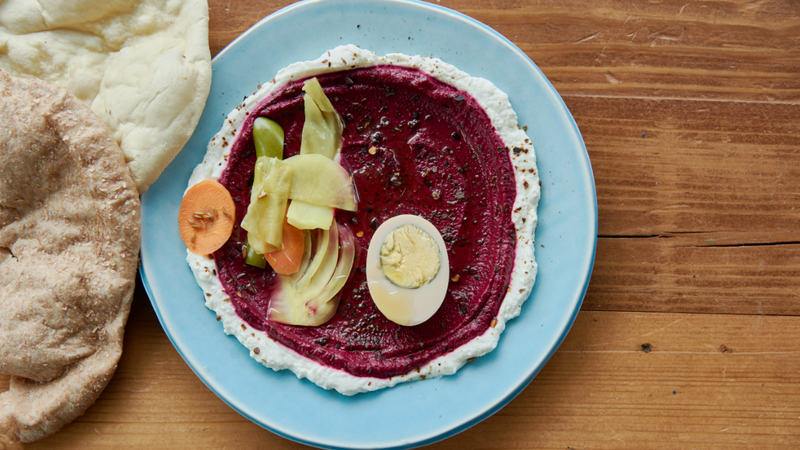 I love your phrase “vegetable forward.” What can Americans learn from Israeli cooking? In Israel, the climate allows for a much longer growing season, much like in California. In other parts of the country like the Northeast, of course forget it — there are limitations to your geography and what you can feature. Vegetables are really delicious but Americans don’t always know how to eat them. I wrote a book called The Book of Greens, a fun practice of how you put greens in everything. And in the Middle East, its just part of the diet. The American diet has gotten very far away from that, but the Israeli diet is much closer to this norm. What Jewish foods did you grow up with? I grew up in kind of a conservative family, my mom was a stay-at-home-mom who cooked most of our meals from scratch every day. We always had Shabbat dinner with challah. There was matzah ball soups and roast chicken and really good brisket. And I remember these big boxes of rugelach we would get from a bakery in Los Angeles — the cheese [rugelach] were always my favorite. We also grew up with the gefilte fish from the jar, so when I moved to the Pacific Northwest I started making gefilte fish with fresh halibut and salmon, which was a pretty delicious upgrade. What do you think Jewish food and Israeli food in America will look like in 10 or 20 years? I don’t know! I think people will start to understand. I don’t think people really understand what Jewish and Israel food is, because it’s difficult, it’s complicated. There are Jews of every color. I never knew that until I spent time in Israel.